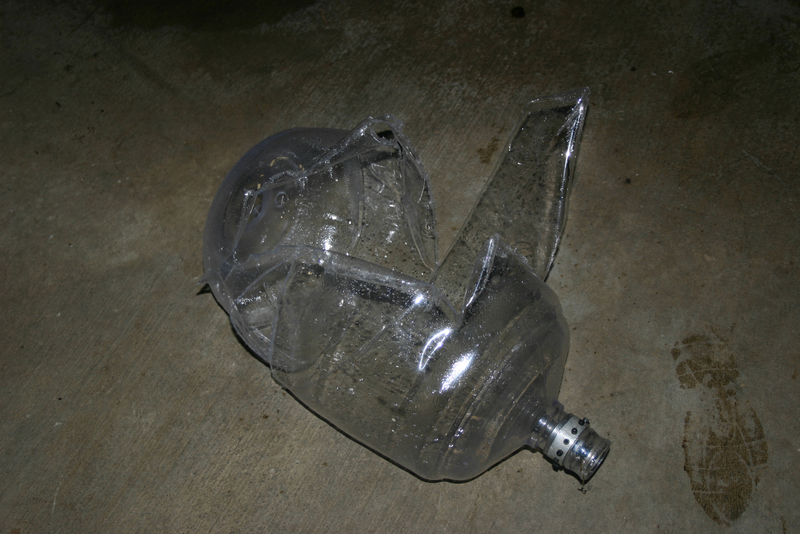 Betterbottle makes 5 and 6 gal PET water bottles. I could only find a source for the 5 Gal, so that is what I tested. MR with water of 29 with peroxide 39! It burst in the thin center with the ends remaining substantially thicker. This means one could probably prevent the banana deformation and increase the pressure with a center overwrap. Another out there concept... this won't work with the muiulti segment tank of the last wild idea, but will work for a single tank. In a H2O2 rocket 80% of the propellant volume is H2O2, so you need to pay more attention to the H2O2 side than the fuel side. Leave a small space at the top of the H2O2 tank. In this space put a solid silver screen/catalyst hung from a thermally compatible string. Unwind the string into the tank letting the silver decompose the H2O2 pressurizing the tank, raise and lower the catalyst to control pressure. 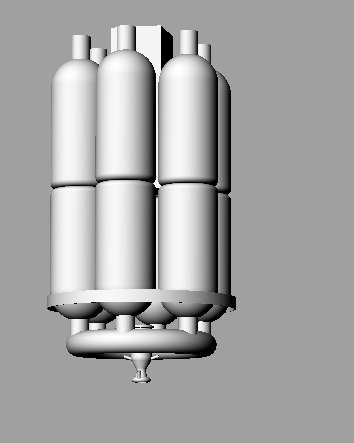 Fuel is pressurized with a bladder from the gas in the main oxidizer tank. Main propellant valve is a simple burst disk. 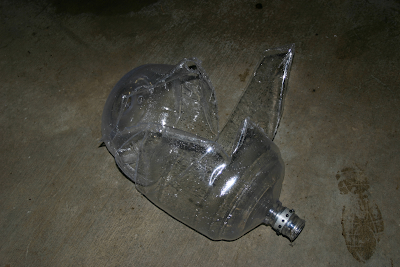 A 3rd stage made of 3L soda bottles surrounding a 3U Cube sat. 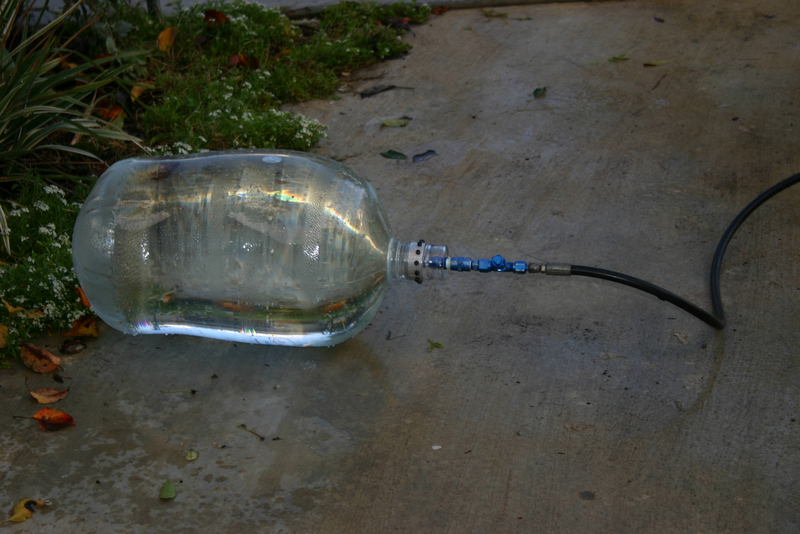 3L soda bottles are good to 100PSI with a Mass ratio of > 40 when used with H2O2. As soon as you go up in size bigger than minimalist nano sat launcher then properly built aerospace quality tanks are a must. A big puzzle with too many knobs. For my U.S. followers remember the Americans that voluntarily offer to pay the ultimate price in defense of this nation. Reguardless of how you view the current conflicts, you can not help but be humbled by the voluntary sacrifce these men and women give in our name. Fill and Drain Umbilical system. 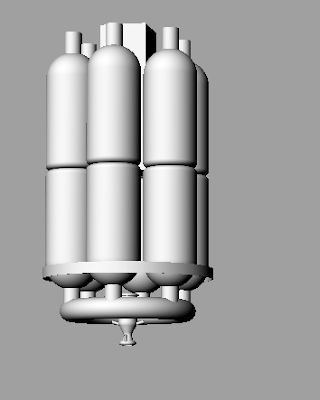 Battery for second stage actuators. Battery for first stage actuators. The scope and scale of what Elon and his troops have accomplished is just breathtaking. I am in stunned awe. I raise a toast to a most unreasonable man! We went out to FAR setup the teststand, and the little stainless motor. The temperature was really cold (45 F) and the cat pack never warmed up. By the time it would have been warm, it was dead, due to contaminated peroxide. I disassembled the cat pack and dropped the screens in the peroxide dregs from the Jug we loaded from and there was almost no activity. I then got a jug from a different batch and tried that, no activity. So I cleaned the screens in 68% nitric acid. I then tried them in both batches of peroxide. Batch #1 killed the screen almost instantly.Batch #2 was reactive, so I let a screen soak in batch #2 after 2 or three minutes the screen was no longer reactive. The only conclusion is that both batches of peroxide were contaminated, batch #2 less so. As a Final test I took a fresh clean screen and the screen that sat in batch 2 and put both in my beaker of peroxide, there was a big difference in reactivity, something is definitely contaminated. My Peroxide supplier thinks it was phosphate and has redone his proces to remove phosphate. The end result is that engine tests will have to wait till I can get new peroxide or get my spargeing plant up and running and make my own propellant. The current tall pole in that process is diesel generator problems/waiting for parts. In the mean time I'm going to work on tank development and some guidance and control electronics.